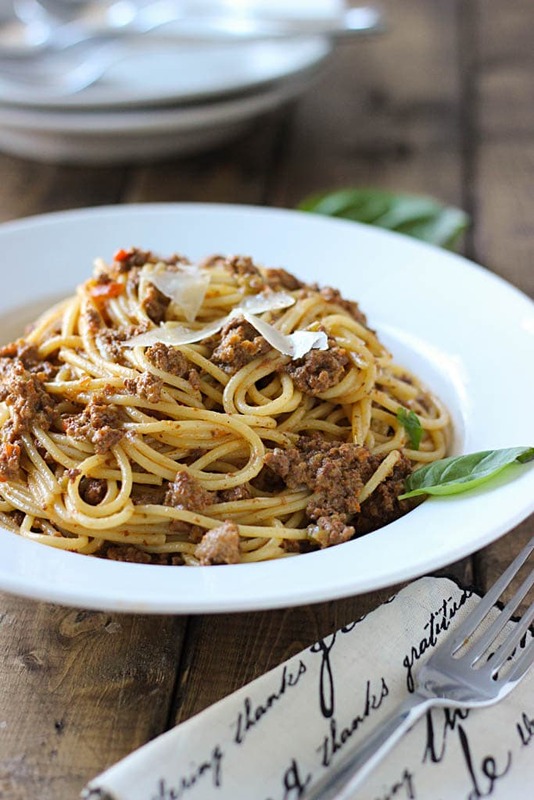 Indulge your pasta craving with this creamy, slow cooker meat pasta sauce. Cooking it low and slow brings out the best flavors! Now that it’s starting to get chillier, I’m all about comfort food. Anything to distract myself from the cold days. Enter a comforting, creamy slow cooker meat pasta sauce that pairs well with all types of pastas. I prefer it with pappardelle, linguine or fettuccine but it also plays nice with plain, old spaghetti or tube-type pastas. 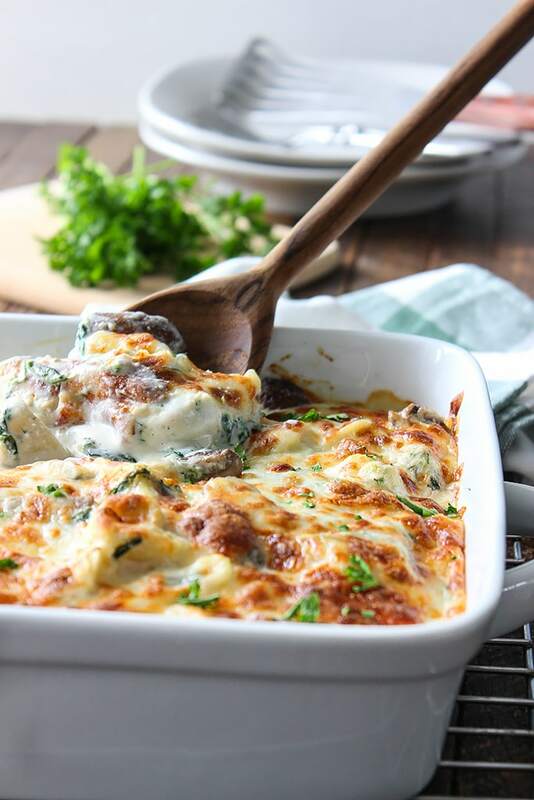 This one is all about a rich and creamy meat sauce that has had time to marry and do its culinary chemistry thingy that makes it yummy by virtue of cooking it slow and low. I’m all about meaty pasta sauces to go with my pasta. Sure they’re not saucy but whatever they lack is made up with lots and lots of richly flavored meat. 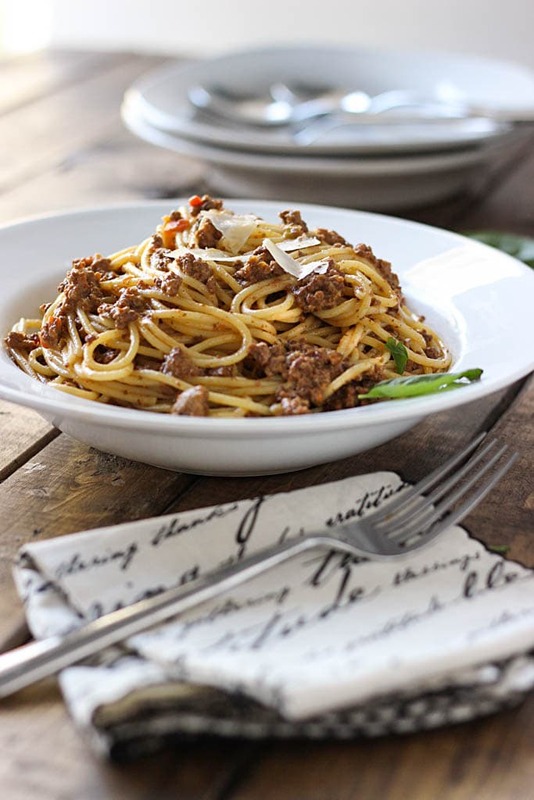 It takes its flavor cues from spaghetti bolognese which is delicious in its own right. Like bolognese, it has the same holy trinity base of diced onions, carrots and celery and tons and tons of meat but this pasta sauce is super creamy. A little bit of heavy cream is added at the end to do this. And instead of standing over the stove for hours wishing you were somewhere else, you can pretty much set and forget this once you’ve sauteed it all down on the stove top. Why do we even need to cook it over the stove top to begin with? Well for starters, you want to coax the fat off the beef so you can drain it before transferring it to the slow cooker or it’ll just pool into an oily mess. And for those that want to add some wine to this, you’ll need to evaporate it. Brown, drain, saute, evaporate then dump it in the slow cooker and let it work its magic for six to eight hours. Pour in some heavy cream towards the end, mix and then toss it with your cooked pasta. The ratio of meat sauce to pasta will look imbalanced but because it’s just a pure meat sauce, it works out. Top it with some shaved Parmesan or regular Parmesan cheese. And hey, throw in some garlic bread or a bloomin onion bread for an appetizer. Make sure to add in the heavy cream last. I don’t like cooking dairy in my slow cooker because it tends to curdle even on low heat. Maybe my slow cooker runs a little hot. But just for good measure, add it in last and stir to mix it up. The meat sauce will look like a gigantic lump of ground beef after it’s done cooking. The heavy cream is what will add creaminess and the saucy element to it. Stir to mix until the whiteness of the cream blends in with the meat. If you want it more saucy, just add more heavy cream. You could serve it two ways. 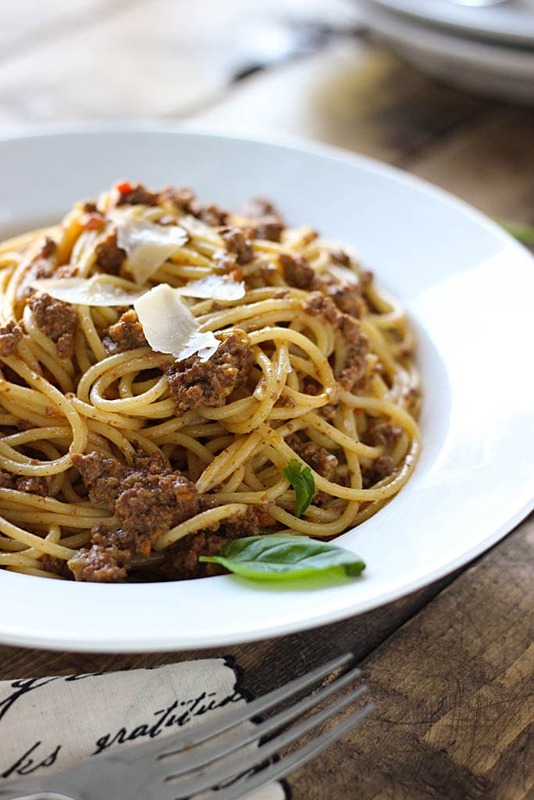 Dish out a plate of pasta and top it with meat sauce, or mix it all together so it’s evenly distributed and people won’t be fighting over getting more meat sauce. 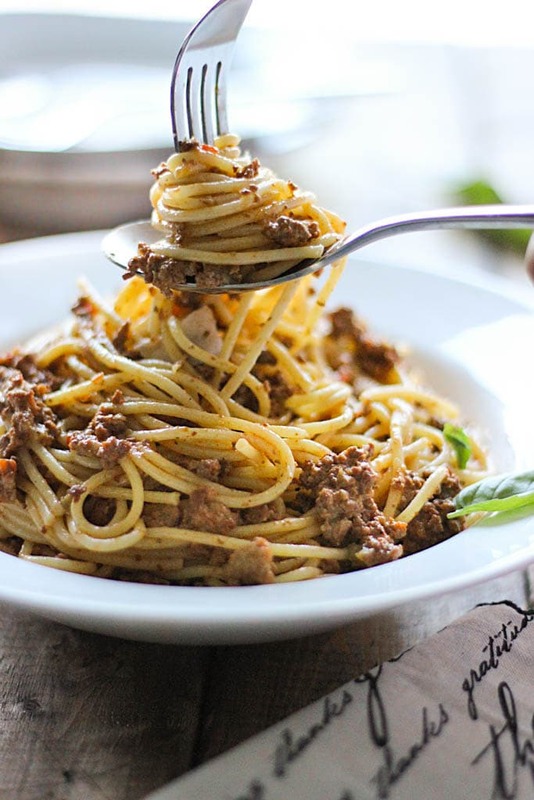 One thing that always, always happens with meaty pasta are people (including myself) tend to pile on tons and tons of meat sauce on the bed of pasta thinking it isn’t enough. Then once you’re done eating up all the pasta, there’s tons of meat sauce left on the plate. The eye will fool you into thinking you need more meat sauce to pasta ratio than you actually do. So the best way to not fall for this is to toss the bulk of it together. Problem solved. No more meat sauce hogging! PS: Like spinach in your pasta? Here’s a recipe for slow cooker beef and cheese pasta! Stove top: Follow steps 1-5. Reduce heat to medium and add in heavy cream. Simmer for 10 minutes or until cream has reduced and incorporated fully into the sauce. Toss with pasta and serve hot. 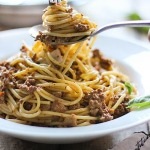 As far as I’m concerned bolognese is and always will be my favorite comfort food! Never made it in a slow cooker though, and I will now. I love that it is cooked for 8 hours – which means I can leave it while I’m at work. Well this is a slight variation, think of it as a creamier version of Bolognese with the heavy cream. So very yummy though. I have to stop myself from hogging it all! Adding cream must have made this dish more yummy … Farah, coming to your blog always made me hungry and that’s not good for my waist 🙂 … I want to try this recipe for our weekend dinner, I just hope to remember taking pictures before we finish eating it! Take pics! I was really bummed when we finished this up. We ended up squabbling over who got the last serving. 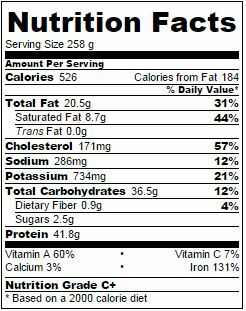 It tastes even better the next day and if you mix it altogether, it gets even better the closer you get to the bottom of the bowl. Hence squabbling over that last serving! 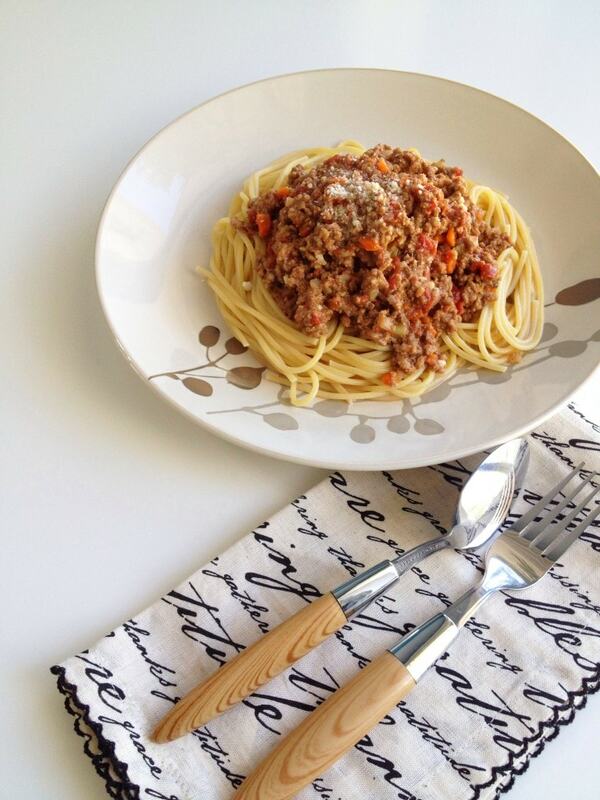 Hi Farah, my gosh, I swear that when I read the words “slow cooker rich meat sauce” I actually started salivating! This looks too easy to not try! It’s seriously one of my favorite meals this season. I’ve made it twice already this winter and I’m gonna make it again next week. So comforting! It’s a pity it doesn’t get that much attention, it’s so good it should be shared! Yesssss! Someone finally sees how absolutely DELICIOUS this is! It isn’t very popular which is so sad because it’s one of my favorite pasta sauces. 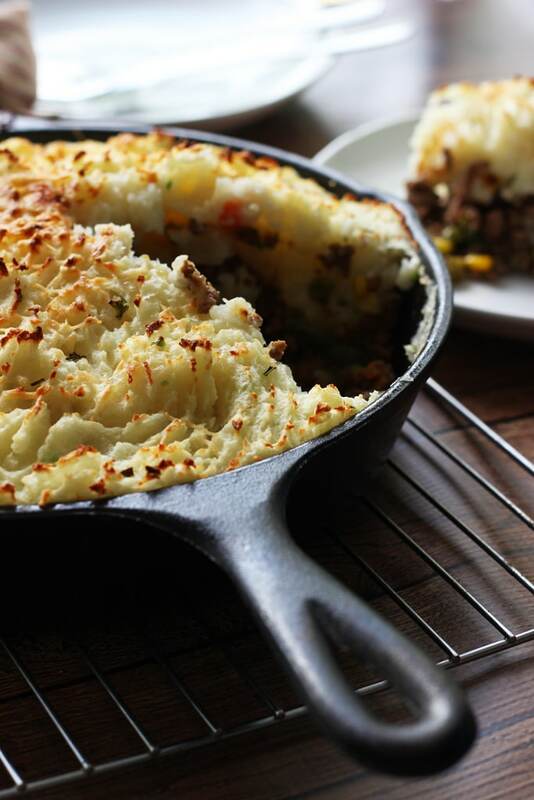 My hubby and I fight over it all the time and I’ve made it dozens of times this past winter for comfort food. I just had some leftovers tonight, cause all your comments made me crave it again! There’s just one more bowl left and I’m hiding it for myself! Oh wow, I’m sorry to hear that! I admit I have heard some horror stories on certain models of slow cookers running too hot even on low. Apparently they don’t run the same and there is no standard which makes things really confusing! So I really recommend reading the comments before trying out a slow cooker. I like going to Amazon to read comments, their community seems to be reliable for that. Really sorry that happened to you and with this recipe too! It’s really worth it and one of my favorites 🙁 If you’re not entirely sure how your slow cooker cooks, try cooking it on low for half the time. The sauce essentially is ready to eat right off the stove top but the slow cooking is just to bring out its flavor. So the 6-8 hours is not the mandatory time for it to cook, just how long you want flavors to marry. Thanks for coming here and putting this out there, so others can be vigilant! Aaaaaaaaamazing- Thank you so much for this recipe! Do you have any suggestions on how to incorporate this into a lasagna??? It’s still the number one pasta sauce we adore in our house! As for lasagna, I would use the meat sauce as regular sauce in a lasagna recipe you trust or one that uses the same amount of sauce (2 lb.). Do the usual layering (ie. sauce/pasta/mozzarella/ricotta) and rinse repeat until you have your final layers of sauce and mozzarella. One final tip is to use good quality ricotta. It makes a HUGE difference!